As the 2011 holiday season nears its end, here is one last treat to add to my list of treats to make next year! If you like s’mores, and if you like gingerbread men, then you are certain to like these Gingerbread Men S’Mores, I would almost guarantee it! 1. In a large bowl, whisk together the flour, ginger, cinnamon, nutmeg, baking soda, cloves, and salt. 2. Using an electric mixer, beat the butter and sugar in a large bowl until light and fluffy (about 3 minutes). Beat in the egg, molasses, and vanilla. Reduce mixer speed to low and gradually add the flour mixture, mixing until just incorporated (the dough will be soft). 3. Shape the dough into four 1-inch-thick disks and roll each between two sheets of wax paper to 1/8-inch thick. Refrigerate until firm (about 30 minutes). 4. Preheat oven to 350 degrees. Line baking sheet with parchment paper. Using floured gingerbread man cutters, cut out cookies. Place on the prepared baking sheets, spacing them about 1-inch apart. Rroll, chill, and cut the scraps. 5. Bake, rotating the positions of the pans halfway through, until the cookies are set and the edges are beginning to brown (10-12 minutes). Let them cool on the cookie sheet for three minutes, then transfer to a wire rack and cool completely. 6. Meanwhile, melt the chocolate chips in the microwave according to package directions. Spread 1 teaspoon of melted chocolate on the flat side of half of the cookies. Place chocolate-side up on a baking sheet and refrigerate until just about set (about 10 minutes). 7. Using an electric mixer, beat the cream cheese and marshmallow cream in a large bowl until fluffy (about 2 minutes). Spread a rounded teaspoon of the marshmallow filling on the flat side of the remaining cookies. Sandwich with the chocolate-sided cookies and refrigerate until set (about 20 minutes). 8. Transfer the remaining marshmallow filling to a pastry bag fitted with a writing tip and decorate as desired (Suspenders? Bow Ties?). The language: Latin, the loose translation (according to anwers.com): “forgive me!” I’m not posting this because I’ve done anything in particular to be forgiven for, but rather, because I’ve encountered a really interesting quotation (anonymous) about forgiveness. Despite squandering an 18-point first-half lead, and finding themselves 9-points down midway through the second half, the Michigan State University Spartans put on a late 20-0 run and handed the scrappy Indiana Hoosiers their first loss of the season in the Big Ten opener for both teams. Next up for the Spartans: the Nebraska Cornhuskers. Go Green! the Manjanggul lava tube (one of the longest lava tubes in the world). the Sangumburi Crater (from an extinct volcano). There would seem to be plenty of things to do and see at this wonder-ful location for any type of adventurer. Yet another seemingly pristine location to add to my list of places to attempt to visit. Ah, so many places, so little time. So, how “bad” have you been this holiday season (in the eating department, that is)? Were you guilty of any piacular transgressions? Hopefully not more than one (or possibly two). I certainly ate more than my share of decadently delicious desserts requiring me to adjust the frequency and intensity of my scheduled exercise for the week. How about you? With the holidays in full swing this week, there was another lighter than usual load for college basketball. But that doesn’t mean the number of upsets were diminished. I mean, come on, this is college basketball . . . if you’re not bringing your “A” game each and every night, anything can happen. The number of undefeated teams has been reduced to six (6): Baylor and Missouri from the Big 12, Syracuse and Louisville from the Big East, Indiana from the Big 10, and Murray State from the Ohio Valley. Michigan State was able to win both of their non-conference games this week (their winning streak is now at eleven) and will open their Big Ten schedule on Wednesday against the undefeated Indiana Hoosiers. Go Green! Xavier (#9) losing to unranked Oral Roberts University. Marquette (#10) losing to unranked LSU. Kansas (#11) losing to unranked Davidson. Pittsburgh (#13) losing to unranked Wagner. Illinois (#24) losing to Missouri (#8). Baylor (#7) defeating unranked West Virginia by only two points (in overtime). Missouri (#8) defeating Illinois (#24) by only four points. Illinois (#24) defeating unranked Creighton by only four points. Lyrics by Mark Lowery, music by Buddy Greene . . . enjoy! ‘Twas the Night Before Christmas . . . ! Here’s an interesting “academic” parody of this yule classic . . . enjoy! ‘Twas the nocturnal segment of the diurnal period preceding the annual Yuletide celebration, and throughout our place of residence, kinetic activity was not in evidence among the possessors of this potential, including that species of domestic rodent known as Mus musculus. Hosiery was meticulously suspended from the forward edge of the wood burning caloric apparatus, pursuant to our anticipatory pleasure regarding an imminent visitation from an eccentric philanthropist among whose folkloric appellations is the honorific title of St. Nicholas. The prepubescent siblings, comfortably ensconced in their respective accommodations of repose, were experiencing subconscious visual hallucinations of variegated fruit confections moving rhythmically through their cerebrums. My conjugal partner and I, attired in our nocturnal head coverings, were about to take slumberous advantage of the hibernal darkness when upon the avenaceous exterior portion of the grounds there ascended such a cacophony of dissonance that I felt compelled to arise with alacrity from my place of repose for the purpose of ascertaining the precise source thereof. Hastening to the casement, I forthwith opened the barriers sealing this fenestration, noting thereupon that the lunar brilliance without, reflected as it was on the surface of a recent crystalline precipitation, might be said to rival that of the solar meridian itself – thus permitting my incredulous optical sensory organs to behold a miniature airborne runnered conveyance drawn by eight diminutive specimens of the genus Rangifer, piloted by a minuscule, aged chauffeur so ebullient and nimble that it became instantly apparent to me that he was indeed our anticipated caller. With his ungulate motive power travelling at what may possibly have been more vertiginous velocity than patriotic alar predators, he vociferated loudly, expelled breath musically through contracted labia, and addressed each of the octet by his or her respective cognomen – “Now Dasher, now Dancer…” et al. – guiding them to the uppermost exterior level of our abode, through which structure I could readily distinguish the concatenations of each of the 32 cloven pedal extremities. As I retracted my cranium from its erstwhile location, and was performing a 180-degree pivot, our distinguished visitant achieved – with utmost celerity and via a downward leap – entry by way of the smoke passage. He was clad entirely in animal pelts soiled by the ebony residue from oxidations of carboniferous fuels which had accumulated on the walls thereof. His resemblance to a street vendor I attributed largely to the plethora of assorted playthings which he bore dorsally in a commodious cloth receptacle. His orbs were scintillant with reflected luminosity, while his submaxillary dermal indentations gave every evidence of engaging amiability. The capillaries of his malar regions and nasal appurtenance were engorged with blood which suffused the subcutaneous layers, the former approximating the coloration of Albion’s floral emblem, the latter that of the Prunus avium, or sweet cherry. His amusing sub- and supralabials resembled nothing so much as a common loop knot, and their ambient hirsute facial adornment appeared like small, tabular and columnar crystals of frozen water. Clenched firmly between his incisors was a smoking piece whose grey fumes, forming a tenuous ellipse about his occiput, were suggestive of a decorative seasonal circlet of holly. His visage was wider than it was high, and when he waxed audibly mirthful, his corpulent abdominal region undulated in the manner of impectinated fruit syrup in a hemispherical container. He was, in short, neither more nor less than an obese, jocund, multigenarian gnome, the optical perception of whom rendered me visibly frolicsome despite every effort to refrain from so being. By rapidly lowering and then elevating one eyelid and rotating his head slightly to one side, he indicated that trepidation on my part was groundless. Courtesy of http://www.about.com’s Urban Legends. Interesting factoid: did you know that 123 years ago today (December 23, 1888) Vincent Van Gogh cut off his left ear. Ouch! That had to hurt! 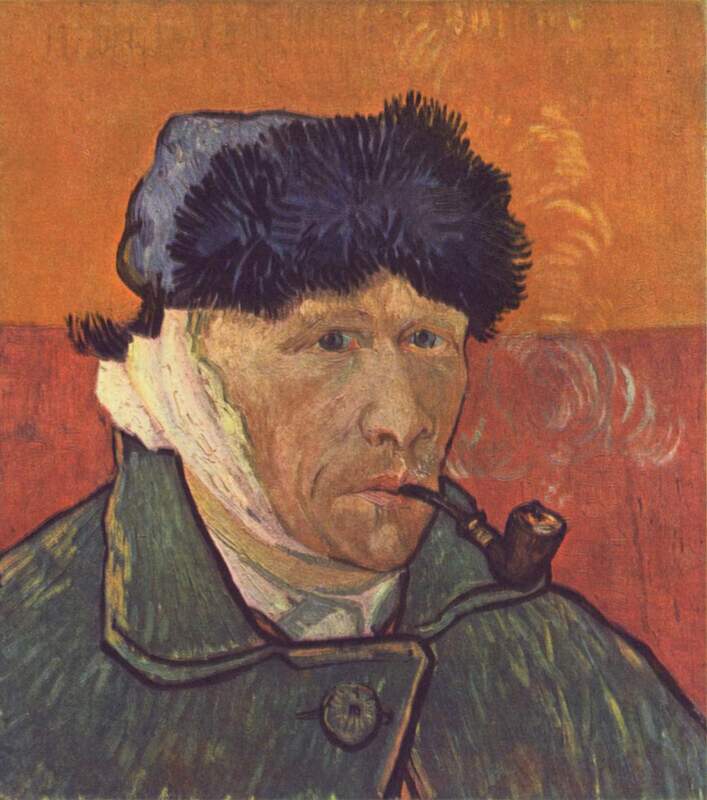 Here is one of his self-portraits with the bandaged ear. While generally considered one of the greatest Dutch painters of all time, Van Gogh was poor and virtually unknown his entire life (as short as it was). He was plagued by depression (despair and loneliness) most of his life and died at the age of 37 from a self-inflicted gunshot wound. Here is a link to the comprehensive Vincent Van Gogh Gallery.